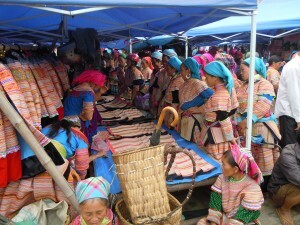 The upland cultural fair is known as the famous brand name in SaPa. It is for a long time until fairs are celebrated. Ordinarily, districts have distinct fairs opened on particular days during week so when coming to SaPa, tourists certainly have opportunity to participate in cultural kermises here. The fair is not only merely a place to exchange goods but it is also the place of showing unique cultural characteristics such as ethnic minorities special culinary, food, costumes, traditional customs, cultural exchange like singing, dancing, playing the flute or pipe-pan…Especially, these fairs are amusement sites for everyone at all ages, for Hmongs and the Dao’s boys and girls gather together to find lovers and make friends. The regional fair is linked to the traditional culture there; however, all fairs are pristine and natural as SaPa’s indigenous people that really captivates visitors. SaPa kermis known as the market of the Hmong and Dao people is held on Saturday and Sunday every week. It is a unique economic and cultural activity including the exchange of many kinds of goods and local products, meeting together at the fair of upland people, and meeting a date for young boys and girls as well. At SaPa fair, you can admire colorful Hmong and Dao’s costumes, join in bustling atmosphere at market or listen love songs, the flute, the sound of pan-pine, the mouth harp to find life partner of the young men and women. When the sunset falls down, young women and men gather into groups and then when the night covers the whole fair’s zone, they, H’Mong and Dao girls and boys, sing and chat all the long night. If they find out their love partners, they will give each other souvenirs and promise to meet again on the next fair sessions. This has been for a long time and preserved until now. That’s why SaPa is an impressive destination for tourists who like exploring the ethnic cultures. Bac Ha is the biggest fair in the mountainous highlands, is usually opened on Sunday. On the way, visitors can see the high mountains, deep pools and terraced fields. In many times, tourists have to stop in a hurry to take some the majestic natural beauty photos and they can meet many different ethnic groups who are smiling and bringing local products for sale are carried on horseback. For being in time, they have to get up very early, especially, they begin going to the market before one day. Bac Ha Fair offers a variety of local products, the essential items: plow, hoe, shovel, knife, vegetables, fruits, honey. The ethnic women and visitors are attracted mostly by the shops selling jewelry, dresses, shirts, brocade and the graceful rattan baskets. You can buy many brocade products as well as see a riot of color from ethnic women dresses such as H’Mong, Red Dao. Foreign visitors often admire this beautiful place when they see the paintings are handy woven with vivid patterns, color harmony and beauty. Man coming to the market can meet and drink together with the “thang co”. It is said that Thang co can’t run out of and alcohol is the same. In the trading noise, you can hear the praise and singing voice ups and downs of young boys like an invitation to girls. Bac Ha tourists, especially foreigners, are very interested in discovering about life and customs of the people in here. Visitors going to the north border province of Lao Cai but missing out on Muong Hum Fair are really pity. Like other fairs here, Muong Hum Fair meets on Sundays, the busiest day of alpine Bat Xat. Muong Hum is under a small valley adjacent to the stream with clear water, surrounded by towering mountains clouds overlap. The Muong Hum weekend fair in riparian is the place that people like Ha Nhi ethnic, Hmong, Chinese, Giay, Red Dao, Dao Tuyen, Han can meet, exchange, purchase and play. Inside the noisy fair, crowded and visitors can not help admiring the outfits of ethnic girls and boys. They go to the market not only for business demands but also go to learn, to have fun, and find their love, so anyone can do pretty much to attend the festival. Here, visitors will have the opportunity to learn more about the daily lives of everyday routines of local people in northwest region and to enjoy the special dishes. From Lao Cai, city, visitors will come to Phong Nien Commune, Bao Thang District, Lao Cai Province to meet the fair. Continuing going down to the 153 Provincial Highway, you will reach the bridge Bao Nhai, in Bac Ha district. From here, down to the Chay River about 10km by boat, visitors will come to Coc Ly. 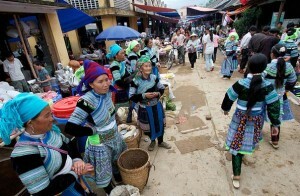 Coc Ly Fair is a market of ethnic minorities living in the northwest districts of Bac Ha. Market is held right next to the suspension bridge spanning the River Flows. Each week the market only has one meeting session on Thursday. Looking from far distance, Coc Ly looks like a picture that is so amazing and very lively. Adorned by the beautiful natural scenery and every group of colorful Mong, Dao, Tay, Nung people with delicate motifs from all the villages in the region pouring together to the Fair, including pedestrians, horse riders carrying textile products, agricultural products and livestock. The fair is divided into separate zones: Brocade zone, mountainous commodities zone, cuisine market zone. People come here to purchase, or exchange of goods (goods used in exchange for goods), and of course for excursions, meeting each other and singing the love melodies. 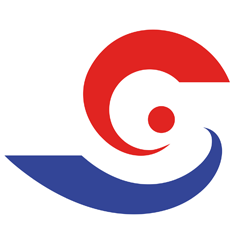 Can Cau Fair is located in Cau Commune, Si Ma Cai District, Lao Cai Province. Coming here, tourists have a chance to get to know more about the colors of fair in highlands, and to learn more about the daily life of people in this place. The scenery of the whole fair is so beautiful and excited. It is organized to be a place gathering people both customers and tourists from many regions, to come and enjoy the variously colorful picture of products and ethnic routines. Looking from a distance, the scene of the fair is so beautiful and lively. The fair is held next to road 153, which is famous for being the unique Redland road connecting Bac Ha town to Si Ma Cai town. Surrounding the fair, there are a series of superb consecutive terraced fields along with the slope of hill and a range of north west mountains. Can Cau is held by Mong Hoa and Giang minorities but works on Dao’s business form. It is opened on every Saturday and on festival days of the years. From early morning, Mong Hoa and many people from their villages pour into the fair, which creates a likely picture of horse riding people and walkers who bring to them agricultural products, textile and brocade, animal, etc. Like some other highland markets, Cao Son market is divided into several zones: Zone selling all kinds of fruits, vegetables, the most attention zone is the place selling livestock, poultry, buffalo, cow and cuisine zone where sells dishes of the famous specialties like Thang Co, corn wine Coc Dam …. It takes about 20 minutes to drive from Muong Khuong town to Lung Khau Nhin Fair- one of the most famous fairs in Lao Cai and large North West zone on every Thursday. Sharing the sameness with other fairs, there are lively colorful scenes of clothes, blankets, fresh green cabbages, orange oranges. In this fair, where you see the fresh colorful picture standing out from silent jungles, lonely mountains and grey sky, as soon as you reach the top of the slope near the fair. The local display their products and goods surrounding the main road crossing the fair and from the main road, you walk a little bit and then a lot of handcrafts of beautiful dresses, unique brocades, etc. Next, animal selling zone including selling pig, chickens, dogs and cats is on your side. You can go ahead to reach food section which is always hustle and bustle due to the crowd enjoying specialties of the fair here. Customers of the fair are from many regions including H’Mong, Nung, Man to go to the fair and enjoy the atmosphere and various products of the unique fair.